Baffle is a member of the Brothers Bears and a retired Funky Bear Investigators agent. 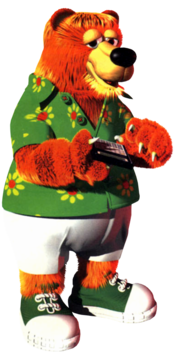 He only appears in Donkey Kong Country 3: Dixie Kong's Double Trouble!, where he operates his own investigative headquarters in KAOS Kore, Baffle's Code Room. Baffle's name is shared with the word "baffle", which means to be confused. This accurately describes his role as a codebreaker. Baffle originally wore a flower-patterned green shirt, white shorts, and green sneakers. He has long, brown hair tied into a ponytail, which is not seen in his official artwork. Baffle is the only Brothers Bear with hair on his head. He was redesigned in the Game Boy Advance remake, where he wears a typical beige detective outfit. This makes his role more obvious. It is unknown if he lost his hair, as his hat conceals his head. Baffle in his Code Room. Baffle is a self-proclaimed master at solving code. However he stumbles upon on a clue he cannot solve. He explains the problem to Dixie and Kiddy, and that he needs the Mirror to solve it. The Kongs can purchase the Mirror for fifty Bear Coins at Bazaar's General Store. Alternatively, if they gave it to Barter in exchange for his No. 6 Wrench, they can repurchase it from him for ten Bear Coins. When the Kongs give the Mirror to Baffle, he deciphers the message. It is a riddle that reads, "To open the gate, at the two stones make an eight." Baffle does not understand the code's meaning, but is at least satisfied that he can read the message. The riddle actually refers to how the Kongs can open the world's Banana Bird Cave, "Sewer Stockpile": by swimming in a figure-8 pattern around two rocks in the lake. 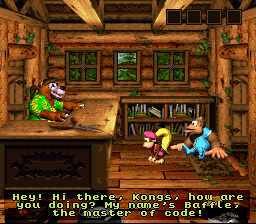 The Kongs are not required to visit Baffle if the player had prior knowledge of the secret; the same logic is applicable to Blunder at Blunder's Booth. Every time Dixie/Kiddy show up at Baffle's after solving the code, his dialogue is selected from one of four sentences, either reversed or scrambled. The player can decipher these messages, which read "Hello Kongs! How are you today? ", "How's it going good buddies! ", "You've just wasted fifteen seconds", or "Haven't you got anything better to do?". This page was last edited on April 4, 2019, at 20:13.